We haven’t had a pseudofossil in this space for awhile. A pseudofossil is an object that is often mistaken for a fossil but is actually inorganic. The above may look like fossil fern, but it is instead a set of beautiful manganese dendrites in the Solnhofen Limestone (Jurassic) of Germany (scale in millimeters). I put this photo on Wikipedia a long time ago as manganese dendrites. That didn’t stop one website from still using it as an example of a fossil. Manganese dendrites are thin, branching crystals that grew over a surface in a rock or mineral. Often they are found in cracks or along bedding planes (as in the above example). These dendrites are usually some variety of manganese oxide. The minerals represented can include hollandite, coronadite, and cryptomelane. Apparently they are never pyrolusite, despite what you may see in textbooks. It is also impossible to tell the mineralogy from the shape of the dendrites alone. How can you tell this is not a fossil plant? For one, the branches are too perfect: none overlap or are folded over or broken as you would expect in a buried three-dimensional plant. Next you’ll notice that all the branches extend from a line at the bottom of the image rather than from a single branching point. Finally, there is no distinction between branch, stem or leaf; instead it is a fractal-like distribution of tiny sharp-edged crystals. This post, by the way, marks the completion of the second year of Wooster’s Fossils of the Week. So far we’ve had 104 posts. Check out our very first edition about a sweet auloporid coral! Potter, R.M. and Rossman, G.R. 1979. 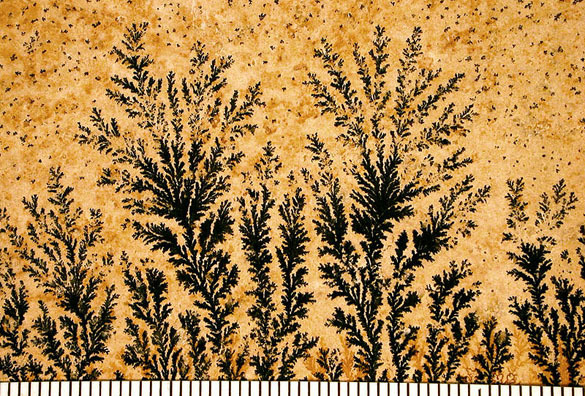 The mineralogy of manganese dendrites and coatings. American Mineralogist 64: 1219-1226. Post, J.E. and McKeown, D.A. 2001. Characterization of manganese oxide mineralogy in rock varnish and dendrites using X-ray absorption spectroscopy. American Mineralogist 86: 701-713.